Bought an Asterix book and two Doctor Who books. Went in Mothercare, Clothkits, Marks and Spencer and Selfridges and Blackwells to buy things for Dad, Mum, me and Becky [my sister]. Had lunch on a low wall nearly at the ground. 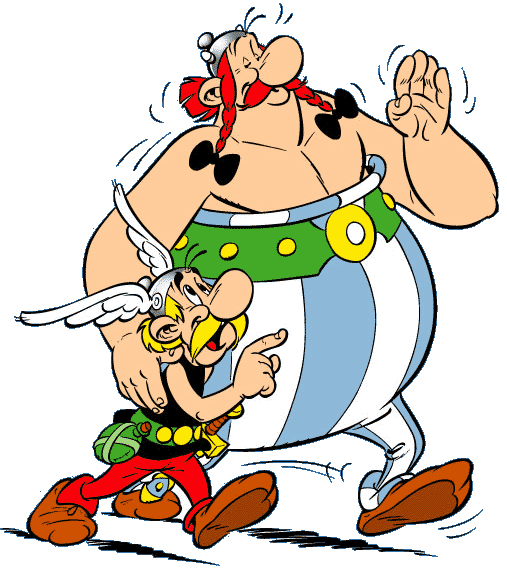 Welcome to another of my obsessions of 1986: Asterix. Earlier in the year I must have been given one of the translations as a present, or perhaps borrowed it from someone. My interest certainly wasn’t prompted by one of the films (Asterix versus Caesar, the fourth in the franchise, had been released the year before), or by anyone at school. As soon as I started reading the books, however, I was hooked. And yet I was hooked in a shamelessly superficial way. In 1986, and for a good few years afterwards, I read Asterix purely for the characters’ imaginative escapades and comic book-esque scrapes. I knew nothing of the deeper meaning buried within, say, the characters’ names or the nuances of the plot. The parodies and topical references passed me by – utterly. It was only when I started rereading them in the mid-90s that I appreciated the books in a whole new way. I don’t for a second imagine this experience to be original. And I certainly felt a bit irked with myself for not appreciating the elaborate whimsy of translators Anthea Bell and Derek Hockridge sooner. But perhaps I’m too hard on myself. How was I to know, at the age of 10, that Dogmatix was a pun, when I didn’t even know “dogmatic” was a word? This entry was posted in April 1986 and tagged Out and about, Reading matter by Ian Jones. Bookmark the permalink. I need to know more about your trip to Clothkits. Wasn’t that a place where you bought bits of fabric and sewed them together at home, thereby looking like the Kelly Family? Did your household rock the home-made look? There were certainly a few homemade items in our respective wardrobes circa 1986/87. Trips to Clothkits stopped shortly after this, probably around the time my mum returned to full-time work and there was a bit more money coming in for, erm, ready-made garments.